What would you say if you had to name your favorite dip? Your favorite spread? On most days, my answer to both of those questions is the same. There's just something about avocados that I find irresistible. You can moosh 'em up until they're chunky. You can take it even further and make them creamy and smooth. Slice them to add beautiful green layers to a sandwich or salad. 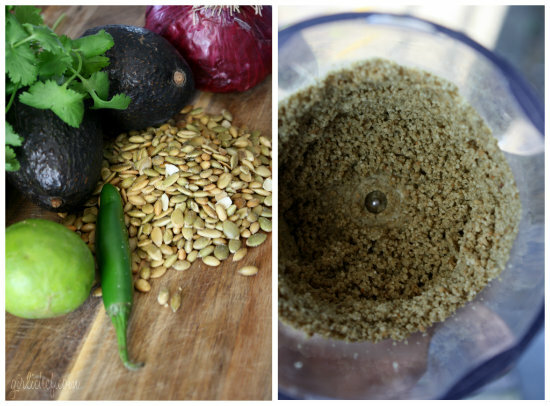 Chunk and sprinkle them over tacos or nachos. Puree them and turn them into dessert. Or, for one of the best dips and/or spreads of all time, smash 'em up with some lime juice, salt, chiles, garlic, onion, tomato, and cilantro to make a simple guacamole. That last sentence is true. I go fairly straight-forward with everyday guac, but it's always fun to shake things up a little and try some fun variations. Rick (Mr. Bayless if you're nasty) has a few pages of variations in the front of his latest book. I decided it was high time to knock some of them out. I wound up with a new favorite (I didn't doubt it by the ingredients) and one that was just sort of meeeeh (good for themes or special occasions, perhaps). Can you guess which was which? My new favorite that I unapologetically ate the whole bowl of by myself (relax, I only made a half batch) was the Bacon and Tomato Guac. BOMB! Seriously. Thick, smoky bacon combined with the smoky heat of chipotles accented by tomato and enrobed in glorious avocado. Per. Fec. Tion. Cook bacon until just crisp, ~10 minutes. Drain on paper towel. Peel the avocados and remove the pits. Scoop out the flesh and place into a large bowl. Mash using a potato masher (or large fork or spoon) until you have a coarse puree. Place onion in a small strainer and rinse under cold water. Shake off excess water and transfer to the bowl, along with the chipotles, tomato, cilantro, and most of the bacon. Gently stir to combine everything. Taste and season with salt. Add lime juice to taste. Serve immediately, garnished with remaining bacon and some cilantro or cover with plastic wrap (directly on surface of guac), until ready to serve. My not-so-favorite was the toasted pepita guac. Don't get me wrong, it wasn't bad. It was just not my favorite. The ground pepitas (pepita butter, if you will) lend this crazy, unexpected, extremely pungent flavor that borders on overwhelming the delicate avocado. So again, good...just not my favorite. I'll probably make it again in the Autumn, when I'm feeling the whole pumpkin thing. Don't let me dissuade you from trying, though! Never know, it could be your new favorite. Pit and peel the avocados. Scoop the flesh into a large bowl and mash up. Place onion in a small strainer and rinse under cold water. Shake off excess water and then add to avocado along with serrano, cilantro, and lime juice. Place pumpkin seeds into a food processor and pulse until finely ground. Scrape down sides of bowl and run processor again until you have a chunky paste. Add paste to avocado mixture. Stir everything together and then season to taste with salt. Serve immediately garnished with some extra pepitas and cilantro. Alternately refrigerate (w/ plastic directly on surface of guac) until ready to serve. Best eaten within a couple of hours. How do you like your guacamole? And if you don't like guac (I'm sure there's somebody out there...), what is your favorite dip or spread? Join Dine & Dish and Cookin’ Canuck for the California Avocado 4th of July Blast, sponsored by the California Avocado Commission. Yum! 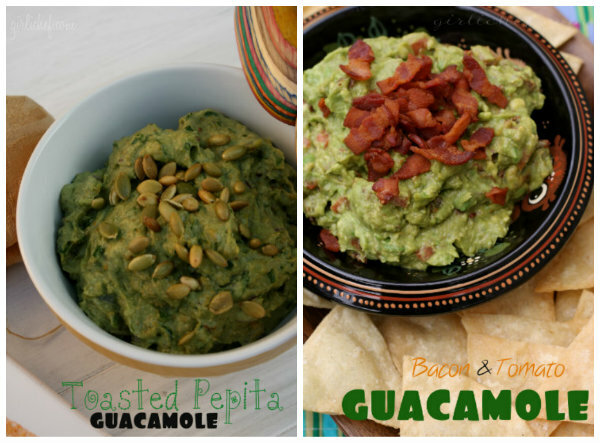 Love how many different ways you can make guacamole, and eat it too! A half a batch huh? Another versatile favorite spread or dip is bean dip or hummus, I make mine with half garbanzo beans and white beans. The only problem I have is with finding ripe avocados . It's hard to always know ahead of time that I am going to need a couple of them. But when I do, the guacamole doesn't last long. "Mr. Bayless if you're nasty" you crack me up! The Husband LOVED that tomato bacon guac. That has been one of his favorite Bayless recipes so far. You may be right about the pepita one being better suited for the fall. I love guac! I think I like the idea of bacon. I've never tried it, but, hey, how could it be bad? It has bacon in it! I've been a Bayless fan for a number of years. I'll have to pick up his latest cookbook. Oh yes, hummus is #2 on my list (some days #1...)! I like the thought of using white beans with the garbanzos. I'll try that next time! I like avocados very much. Yum! I have just started eating guacamole and love it. I will have to try the bacon recipe, it looks amazing. They both sound great. Have a super week. I know you said you didn't like the pepita version as much but seeing as how I am a nut butter FIEND...I think it needs to be tried! My favorite dip? Easy! 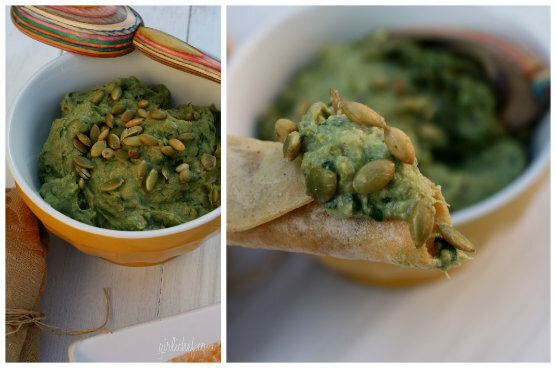 Guaca-salsa-pesto-churri sauce. I wish I wasn't the only one in my house who likes avocado. If I make a batch then I do eat the whole thing (along with an overwhelming amount of chips). However, I may need to make an exception for this bacon version. They both look terrific! 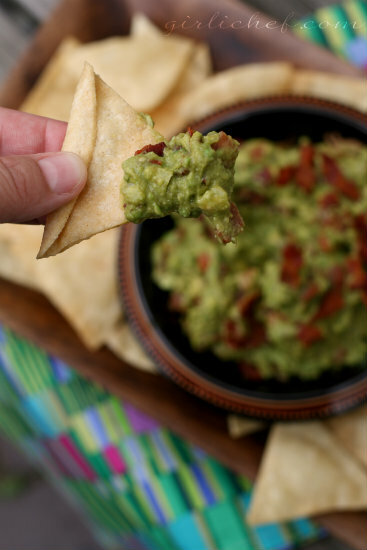 Mmm, bacon guac. As Guy says, "I'd eat that off a flip-flop!" I tend to like my guacamole simple but Rick Bayless has converted me somewhat with his variations. I was intrigued by the pepita one but might not hurry to make it now. If I ever go back to bacon ;-) that one will go to the top of my list to try. I ha ve powerless over guac's hold on me. Both versions look wonderful. I love the creativity of adding the pepitas. Yum, I would have made/eaten the entire batch of the BT guac, yum! I only started liking guacamole, and indeed avocado, recently. Our travels in California convinced me that I not only like avocado and guacamole, I love it! As for your bacon and tomato guacamole, what an inspired idea! It just sounds amazing and I know a whole lot of people who are going to love it! I do like pepitas, but I'm not sure if I'd love them in guacamole either - it sure looks beautiful in the picture though.